The aim of our Super Connected Oxford programme is to enable superfast broadband for everyone, everywhere in Oxford. We are pleased to report that significant progress has been made. By working with partners, Super Connected Oxford has enabled Wi-Fi on all the buses in the Oxford Smart Zone and there are now 40 Public Buildings with Free Public access Wi-Fi for everyone to use. 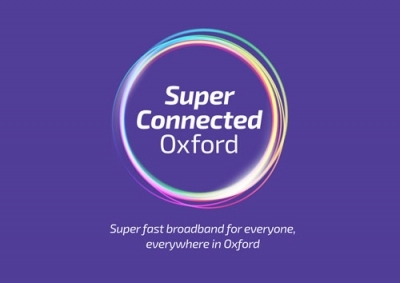 In addition to the many Oxford and Oxfordshire businesses that have improved their Broadband connection speed using the available Connection Vouchers this is real progress towards improving the infrastructure and connectivity of Oxford and the surrounding area. We believe this will noticeably improve the digital and connectivity experience of all residents, businesses, students and visitors when working, learning, traveling and communicating. Oxford is now one of the 50 cities in phase 3 of the Government's SuperConnected Cities Programme which was launched in summer 2013. The Government has committed a further £40 million for the SuperConnected Cities programme, which is managed by Broadband Delivery UK (BDUK), a unit within the Department for Culture, Media and Sport.